It's August! Too quickly summer days slip like coins through my fingers. I want to save each sweet second. So, I jam. Year's ago, women like me labored hard, sweaty hours turning backyard berries and plums into necessary provisions. I act out of longing. 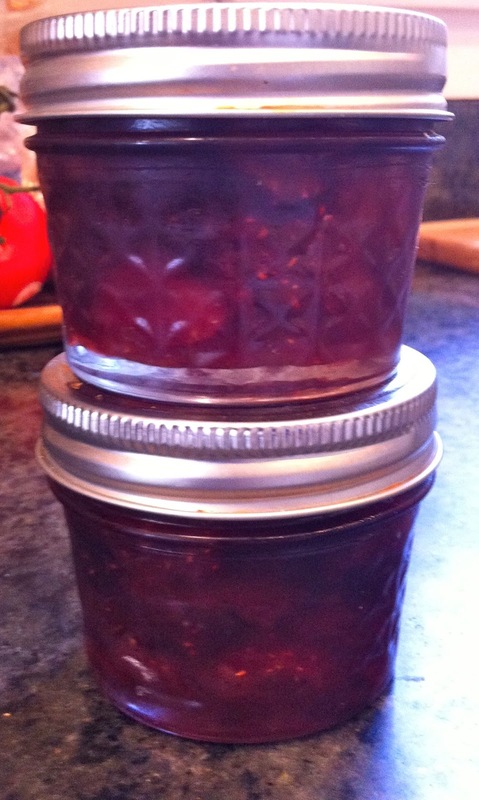 Putting up preserves captures summer's fresh flavors like a snap shot of sunshine. 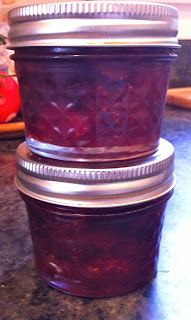 Making jam is so easy you almost don't need a recipe. The fruit just needs to be cooked long enough for its juices to reduce until thick enough to coat a spoon. Then, it's turned into clean jars with those rubberized lids, set in boiling water for about 10 minutes, and stored in a cool dark place. If you don't want to mess with that "water bath" process, you can freeze the jars after they've cooled. Use whatever fruit you have on hand -- raspberries, blueberries, peaches, and plums. Summer is the season of improvisation and spontaneity, so, roll up your sleeves and jam. Put the berries into a wide, non-reactive saucepan. Set over medium, high heat and cook until the juice begins to run. Gently stir in the sugar slowly until it's fully dissolved. Increase the heat and bring to a boil and cook for about 5 minutes, stirring frequently. To test, put a teaspoon of jam on a cold plate. If it wrinkles when you press it with your index finger, it's set. It should reach 220 degrees F. on an instant read thermometer. Ladel the hot jam into the hot, sterilized jars, leaving 1/2 inch of "headspace". Wipe the jar rims and place the lids on the jar. Screw on the bands until they are just finger tight. If processing the jars, set them in a large pot with enough boiling water to cover by 1 inch. Boil them for 10 minutes then let turn off the heat them stand in the hot water for another 5 minutes before removing the jars. Cool the jars for at least 12 hours before storing them in a cool, dark place.